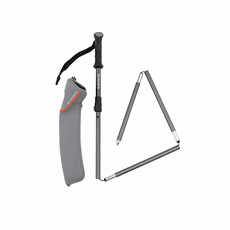 The Caddis Fly Shop offers Sales and Reviews of the best fly fishing boots including Patagonia, Korkers, and Simms Wading Boots. 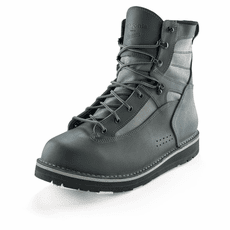 Felt and studded wading boots delivered with FREE shipping and no sales tax from the Caddis Fly Shop! The Caddis Fly Angling Ship has a whole back room practically dedicated to our inventory of Simms Wading boots, Patagonia Wading boots, Korkers wading boots, and we even have to climb a ladder to pull some of the odd sizes for local, regional, and international orders. 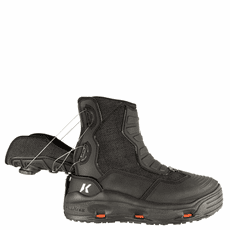 We stock the best boot brands including Patagonia; Korkers; Korkers Omnitrax boot soles; Simms; Flats wading shoes; and all sorts of wading accessories, studs, felt soles, laces, and such. 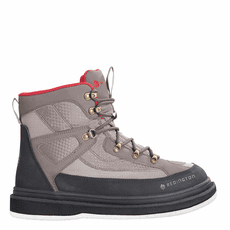 As an aside, check our closeouts and sales section for specials on Patagonia wading boots, if you're looking for closeout or clearance on the best wading boots. Who wears boot foot waders these days? Many of our Caddis Fly Pro staffers, the old duffer, remember the era when wading boots were unnecessary, because people all wore heavy black UniRoyal chest waders or rubber hip waders were the trademark of fly fishing, heck, fishing for anything was marked by boot foot waders of some sort. Not no more. Nope. Today, stockingfoot waders, for a ton of reasons, are the standard for fly fishing, at least if one happens to plan on fly fishing while standing in the water, as opposed to standing on the riverbank, lakeshore, or in a boat. Consequently, wading boots are crucial, because there ain't no fun to be had in wading without wading boots, unless it is on a sandy beach. Discovering that our wading boots have been eaten by a bear during the night is one lousy way to wake up in steelhead camp. By the way, bears, raccoons, skunks and wolverines do eat wading boots. Yes they do. They love to eat wading boots, Our number-one fly rod, our finest fly reels, and our best wilderness fly lines. Bears normally do not, however, eat our sturdy Yeti Coolers. OK. Our topic here is wading boots. We know and love wading boots, big time. Call us with questions on Simms, Patagonia, Korkers or other brands as we have vigorous experience with them all. If you are wondering about the felt soles versus vibram controversy, just know that we are agonizing with you. 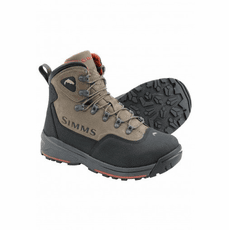 We have extensive experience with the Simms product line of StreamTread Vibram non felt wading boots and we do recommend, in most instances, the use of Simms Star Cleats, the Simms Hardbite Studs, and the Grip Studs for use with these non-felt sole wading boots. Fact is, we usually used studded felts before Simms discontinued felts from their product line, and we think that most of our grip on the slippery bottom was from the studs rather than simply from the felt.